I was not sure what are the best proportion of soy milk and gelatin. Luckily I remembered My Kitchen Snippets prepared the similar pudding, thus I adapted her basic recipe and made my own creation of new flavours. Thanks Gert! 2. Put the soymilk and sugar in a saucepan, cook over low medium heat until bubbles form around the edges of the saucepan. 3. Remove from heat and stir in the gelatin. Stir until the gelatin dissolved. 4. Pour the mixture into ramekins or cups and refrigerate until set. 5. Enjoy with palm sugar syrup and grated ginger. You may replaced palm sugar syrup with brown sugar syrup, but palm sugar syrup give you a nice coconut aroma. Actually i did not prepared palm sugar by myself, I bought RM 2 fresh soymilk(without sugar) from the pasar pagi (morning wet market) and ask them to give me some palm sugar syrup. Also , remember to serve this pudding with finely minced ginger . The ginger is perfectly match with the soymilk and the palm sugar syrup( gula melaka ) .. Do try out, I bet you will love this dessert! Yummylicious pudding! Just got back from jusco shopping...this would be perfect for my hunger now...hehehe. I love this! 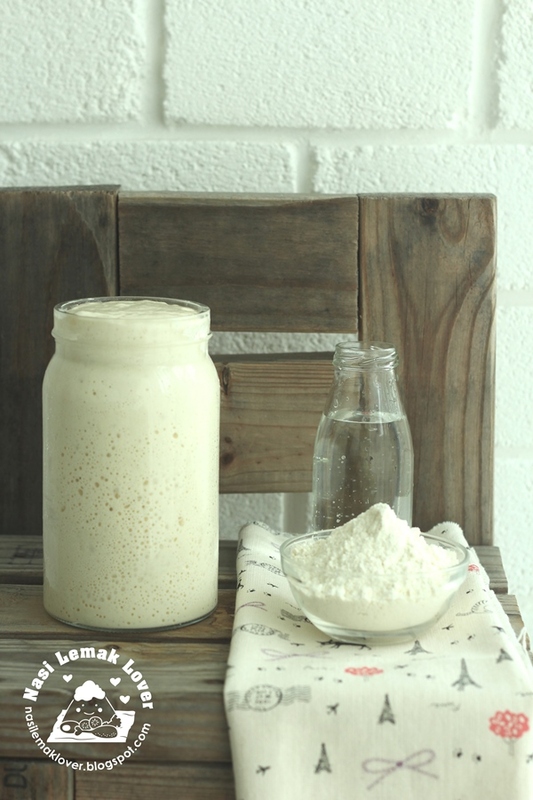 Gotta try it next time when I make some soya milk. Great looking dessert, sounds very refreshing with grated ginger. How about to add ginger juice in the soy milk. Will it work that way? Yummy! I like pudding to be served together with ginger...wanna try this next time! Little inbox, maybe it work, but I'm not sure. But it is not advisable to add into soymilk, at least if one can not take ginger and they have a choice of not to add ginger. I want to make this! Thanks for this great idea Sonia! I love almost any kind of pudding and this is definitely on of them! 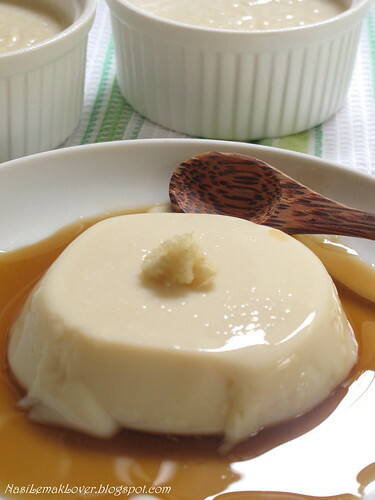 i also love this kind of pudding, just knew that have to take this with the grated ginger. Yummy pudding,looks awesome and easy to make. Wonderful dessert , looks amazing ! 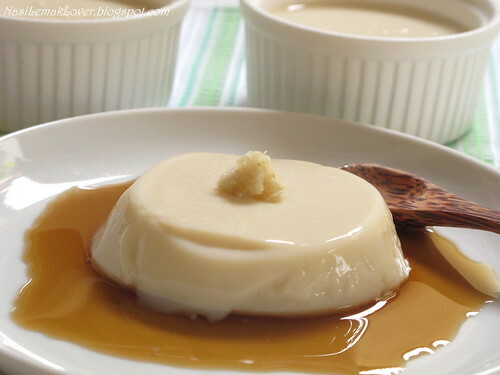 soymilk pudding yummyy.. I saw something similar in Elin's too. but she used agar agar instead..
Looks like you're making full use of your ramekins, Sonia. 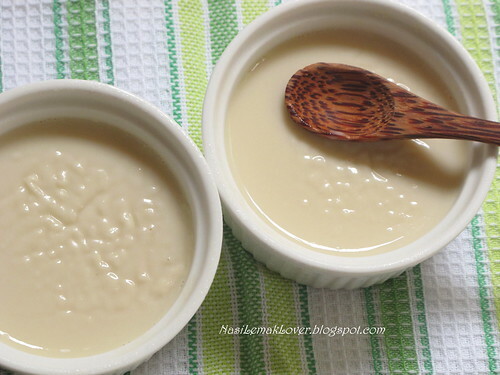 Your soymilk pudding looks so smooth and yummy! Slurp! Happy Winter Solstice to you and your family! Look like something we would like. My girls love panna cotta, quite similar ya? given that i have a lactose sensitivity..this is perfect!!!!! I'm going to try this one out for sure! This looks so yummy. I have to try this. 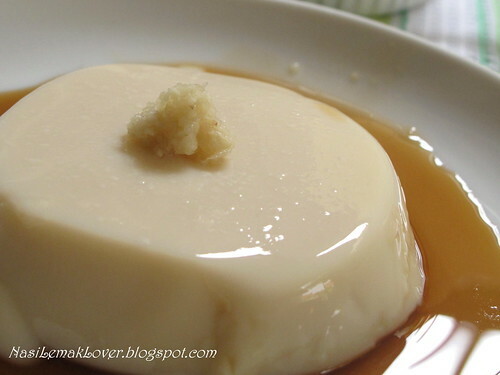 we love tau fu fah so Im sure my family will love this too. delicious! wonder if i can use custard powder to do this... will surely try! is there any method for gelatin to dissolve completely?cause i have tried out this pudding but seem like the gelatin didn't dissolve completely.i can still spot some tiny solid particles of gelatin on the pudding's surface. the outcome is very soft too like in semisolid and semiliquid form. Hi Anonymous, try to stir the gelatine and water till mix well, and quickly pour into hot soymilk while the soymilk still hot in order to dissolve the gelatine. ths s so easy... i'm defenitely gonna try this summer..
that sure looks good.. i want to have 2 bowl... i am greedy. I made this with soy milk too. This dessert is very popular in Sgp but very expensive. A small tub (~120ml) costs S$1.50. If I buy a 1litre from the supermarket, I can make 8-9 servings @ under $3.